When you start a landscape design, one of the best places to find inspiration is your own home. Consider its unique architectural qualities, for instance. Whether it’s a paneled front door with a decorative crown, tall columns or a deep gable roof, your landscape should not compete with these elements, but rather align with and complement them. 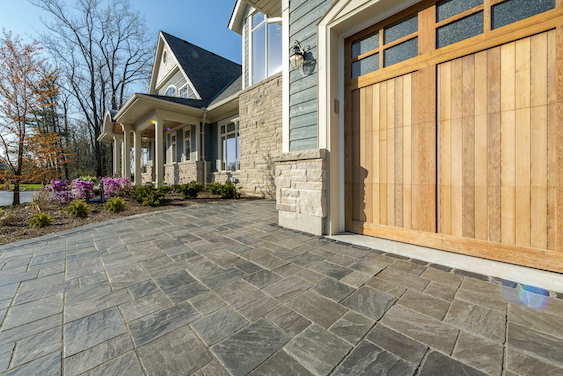 Considering the variety among home designs — it’s likely even noticeable in your own neighborhood — it’s easy to see the value of a manufacturer that offers patio paver designs in a wide range of colors, textures and styles. That’s why Green Impressions partners with Unilock, North America’s premier manufacturer of paving stones and retaining walls, for projects. 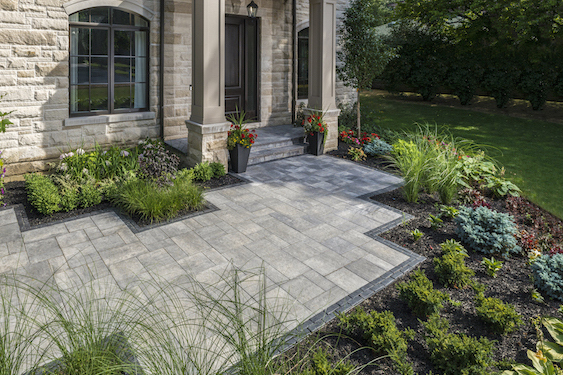 For inspiration, here are four sample styles of Unilock pavers paired with a home’s architectural features. Known for its long, clean lines and minimalist feel, Artline patio pavers pair perfectly with modern home designs. 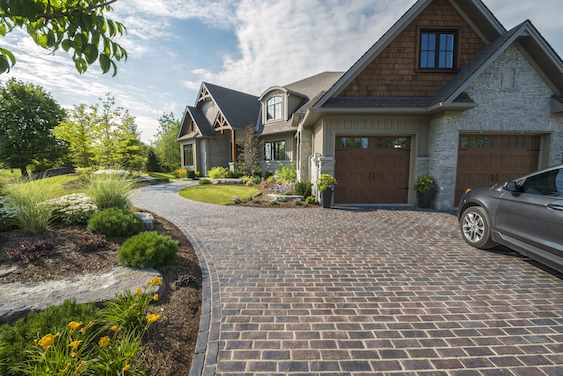 In this case, the straight lines of the driveway pattern create graphic appeal between the curved windows of the home, while darker accent colors tie back in with the color of the front door. The combination of stone details and a wooden garage create a lot of visual interest in the exterior of this home. With natural stone surface textures and appearance, Richcliff patio pavers offer a nice balance between these two elements to round out the landscape. When it comes to capturing the historical essence of streets in Europe, Town Hall patio pavers deliver. Designed to mimic heritage brick pavers, this style of Unilock paver adds character to homes that already have dynamic personalities. The blend of materials in the home below is just one example. For homeowners who want to add to the appearance of natural stone, Bristol Valley patio pavers (with their subtle color and moderate surface texture) are a great option. 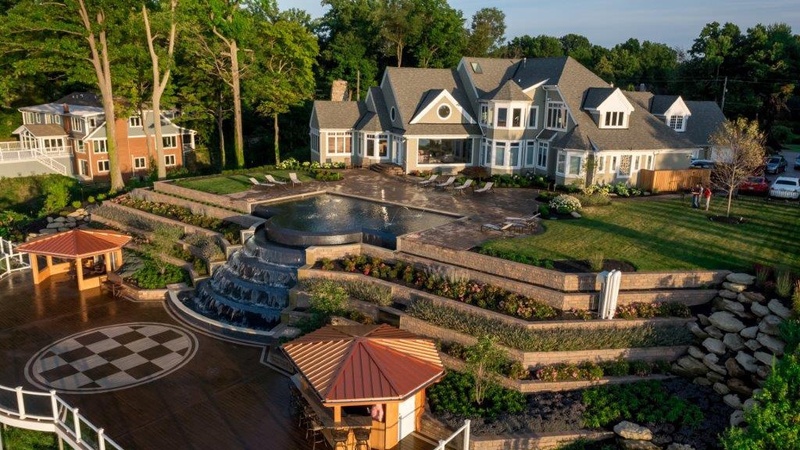 The border included in this home design provides a unique contrast to the color/texture of the main paver while drawing the eye to the ornate pillars around the front door. When choosing patio pavers for your landscape, your home’s exterior should set the tone for which styles, colors and textures are used. 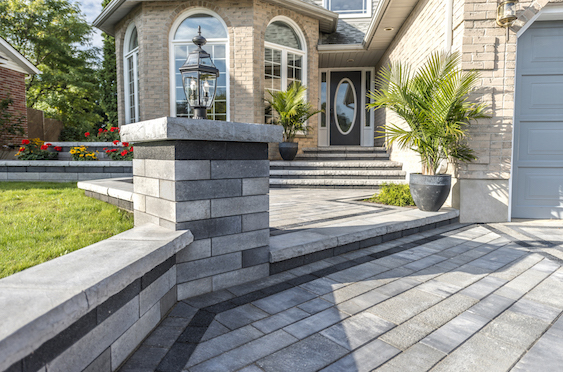 Thanks to the extensive choices offered by Unilock, you’ll have the resources you need to create a cohesive look and feel between your home’s exterior and other elements of your landscape. Beyond extensive palette opportunities, Unilock pavers also offer the benefit of a strong, slip-resistant and easy to maintain surface. Ready to start building the landscape of your dreams? It all starts with the right foundation. Request a free consultation from Green Impressions to get started.